The shortest distance between two points now is authorized for development. Rail riders traveling between Plano, Richardson, Addison, Carrollton, North Dallas and Dallas/Fort Worth International Airport will be able to bypass the trip through Downtown Dallas with completion of the Cotton Belt regional rail line, now scheduled to open in 2022. DART owns 54 miles of right of way from north Fort Worth to downtown Wylie, which originally was owned by the St. Louis Southwestern Railway and commonly known as the Cotton Belt. The agency has long planned to develop regional rail service along the 26-mile eastern portion of the corridor, but because of the 2008-09 recession, the agency deferred the project to after 2030. Cities and other stakeholders along the Cotton Belt asked DART to expedite the project. By identifying regional funding sources and reducing the scope, the agency has an opportunity to accelerate the schedule by more than 10 years. The plan is contingent upon federal funding and environmental clearance. The east-west-oriented Cotton Belt will intersect stations along the Red, Green and Orange lines and provide long-awaited rail service to the town of Addison. 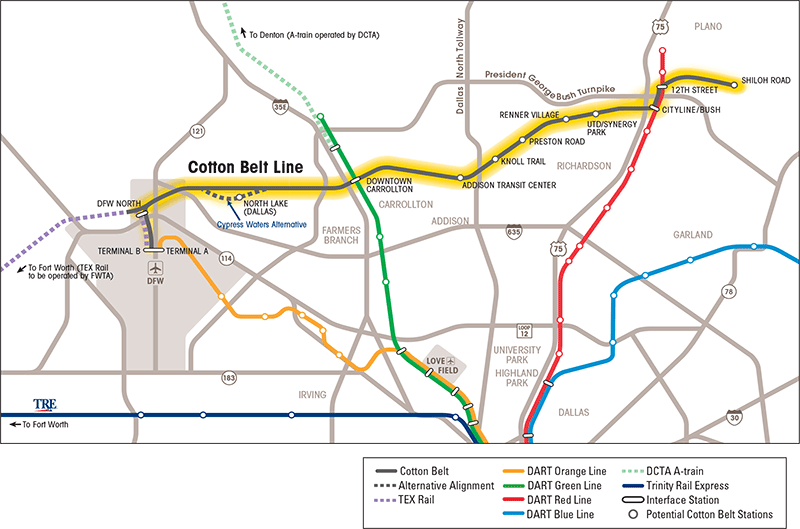 Travelers on the Fort Worth Transportation Authority's TEX Rail commuter line will be able to connect to DART's Cotton Belt at DFW Airport. "We are very excited about the Cotton Belt project," Addison Mayor Todd Meier said. "It will help take our economic development boom to the next level, connecting us even more completely to our region and bringing us the transit part of our transit-oriented development for Addison Circle." DART is pursuing a loan from the Federal Railroad Administration's Railroad Rehabilitation & Improvement Financing (RRIF) program to finance the project. If the agency can obtain a RRIF loan, it would come at a substantially lower interest rate than conventional tax-exempt debt. DART is developing plans to expedite regional rail service on the eastern portion of its right of way along the Cotton Belt corridor.